Ron-Robert Zieler in action for Hannover this season. 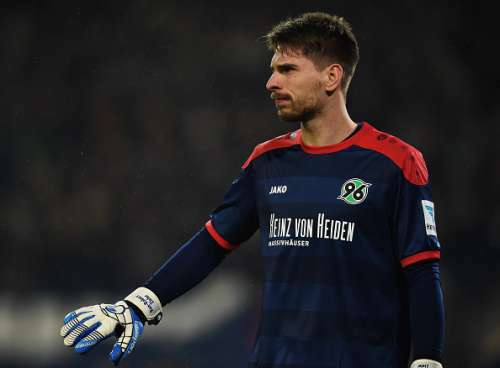 Goalkeeper Ron-Robert Zieler has announced he is leaving the relegated Hanover at the end of the ongoing Bundesliga football season. The 27-year-old, who plays since summer 2010 for the "Reds", cited his wish to continue playing in the top flight as the reason for his departure on Tuesday, reports Xinhua. "I do not want to beat around the bushes," Zieler said. "I feel strongly connected to Hanover, but I am very ambitious and my goal is to play in the top-flight, also in the coming season." Zieler has made overall 182 Bundesliga appearances as well as six international caps for Germany. Hanover sit on the last place of the standings. They will be relegated into the second division for the fifth time after 14 years as they have no chance to reach safety with three rounds to spare.